"AccuGroove is not a market-driven company where we have pressure being placed upon us from the sales department in trying to get us to introduce something before its ready," asserts AccuGroove co-founder Mark Wright. "When we start a project, there are no time restrictions or budget limitations. The only goal is sonic purity and total reliability. We don't even calculate the cost of any cabinet until the project has been completed and our objectives have been reached. We simply refuse to compromise the sound and reliability of our products in order to deliver something to the market faster," adds Wright. Since 2002, Wright and David Innis have been building high-tech AccuGroove cabinets in their northern California workshop. At the foundation of their engineering concepts are atypical speaker configurations which feature low, mid, and high frequency speakers that are sealed within isolated compartments to deliver a full-spectrum sound in a single, compact enclosure. By housing the speakers in their own specially tuned "cabinet within a cabinet," each driver is able to retain its distinct sonic signature while generating optimal response without adding any unwanted colorization. 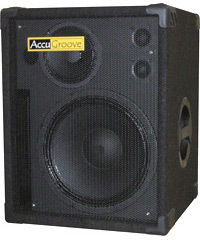 Whether they are utilized on the stages of small clubs, large arenas, or outdoor venues, the innovative AccuGroove design produces a studio monitor sound which faithfully represents the true tonal palette of the amplified instrument and is endorsed by many of today's top bassists including Bill Dickens, Keith Horne, Todd Johnson, Yves Carbonne, and Steve Lawson. 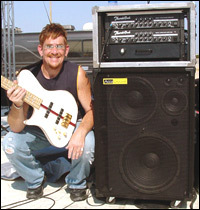 In this interview, Mark Wright discusses the advantages of AccuGroove's "one cabinet does it all approach," common features found on all AccuGroove cabinets, the components used in the construction of AccuGroove cabinets, the massive Whappo Grande, and building signature model series cabinets with Bill Dickens. How did you get into building bass cabinets? It's the last thing in the world that I wanted to do. As a bass player for over 30 years, I had mixed and matched multiple PA and bass cabinets and then ran them through complicated bi-amped systems to achieve something similar to the sound I wanted to hear. Although it helped, it was still light years away from the sound that was inside my head. I was looking for the true sound you get in a controlled studio environment, and I wanted that same sound at any live venue so this entire business started as a project to solve my personal frustration in trying to obtain the sound I was hearing in my head. My good friend David Innis had been building amazing guitar, bass, and high-end stereo cabinets for over 20 years. I asked him if he would help with this project and thankfully he said yes. The goal was to build the ultimate, no-compromise bass guitar cabinet. To make sure we could facilitate this, we had two major guidelines. First, it didn't matter how long it took to complete the project, and second, it didn't matter how much it cost. When the smoke cleared a couple of years later from testing over 1200 drivers from all over the world along with testing almost every type of cabinet design imaginable, we were finished. I had my cabinet, and I was overjoyed! However, things got out of control when monster players Myron Dove (Santana) and then later Polo Jones (Whitney Houston) heard my personal cabinets. They wanted me to build them cabinets like mine to use on tour, but I simply told them that these were my personal cabinets and that I didn't build anything to sell. Soon after, I was told that I owed it to the bass community to bring these cabinets to market because I'd be filling a huge void. After a lot of pressure, guilt, soul searching, and time, we built both Myron and Polo cabinets for their respective tours. Then, we thought we should see if they were right about there being a need for these cabinets, and we wandered if they would actually solve problems for other players. The best way to test things out was to get a booth at the winter NAMM show and see what would happen. If players thought they were as good as the best gear on the market, that would be a great accomplishment but not good enough to motivate us to start a company. However, if things went crazy and people thought they were light years ahead of the competition, we'd have no choice but to move forward. It was simply an amazing NAMM show with players and potential dealers wanting to order cabinets. Everyone thought we were joking when we told them the cabinets weren't for sale because we didn't know how much they were going to cost. After that show, David and I were in business. We went home, reverse engineered our cabinets to figure out what they cost, and then got back in touch with the interested dealers. Can you explain the design principles of AccuGroove's 4-way and 3-way "cabinet within a cabinet" speaker configurations and what makes them different from typical speaker cabinets? In order to explore what type of cabinet design might meet my needs, we had to start by analyzing what was not working for me personally. We found that most everyone was using standard 2-way systems consisting of two woofers with a horn, three woofers with a horn, four woofers with a horn, six woofers with a horn, or eight woofers with a horn. Although many players are happy with their 2-way cabinets, we found that the woofers and horns were responsible for covering far too much sonic territory, and the components were straining by trying to do too much. The only thing that made sense was to break the sonic spectrum up into smaller sections so each driver could focus on a specific frequency range and therefore be responsible for less work which would in turn allow the speakers to remain true to their sound. These discoveries lead to the design of our 4-way cabinets which include a subwoofer, woofer, midrange, and tweeters. Each driver has their own separate cabinet within the main cabinet so each driver is completely isolated from the other drivers insuring they do not interfere with one another. Each driver has its own uniquely tuned port designed to fine tune that frequency to perfection so although they look fairly normal from the outside, there are actually three additional, separate cabinets on the inside. Later, we simply scaled the same principles down to a 3-way design to facilitate a smaller cabinet. If someone were to ask you to define the sound produced by an AccuGroove cabinet, what would you tell them? An AccuGroove cabinet produces the true sound of any instrument that is plugged into it just like in a studio or through a high-end set of headphones. The sound isn't sterile. It's natural and unexaggerated. You can hear every nuance, every EQ change, and so forth. Players tell us that our cabinets sound like studio monitors. Why is it so difficult to faithfully reproduce the total spectrum of an electric bass guitar's tonal capabilities? Contrary to what most people believe, the bass is actually a very broad instrument sonically especially when compared to a regular guitar that is very mid-focused. The low end is extremely power hungry and difficult to keep tight and punchy. If you add to that the complex task of blending in the intricate low mids, mids, upper mids, and high end to reproduce everything accurately and cleanly, you have one nightmare of a task. For example, we could have the best 15" woofer on the planet, but if it is quieter or louder than the 12" speaker, the mids, or the tweeters, what good is it? It's all about rolling up your sleeves and investing the time to test all these drivers and tunings while mixing and matching them along with different crossovers to find the most natural blend possible. Another aspect of development is staying passionate so you don't compromise your goals after testing 1,000 drivers and then stop short of perfection by saying this is good enough. It was all about investing time in exploring every conceivable combination and being committed to not stop until the project was completely finished with no stone left unturned. What is it about AccuGroove speaker cabinets that characterize them the most from the dozens of cabinets built by other manufacturers? First, they are not pre-colored so you can make them sound like anything you want by adjusting your EQ and panning your pickups. They really are chameleons for each venue, bass, and style. Second, players tell us they are replacing their current larger cabinets with our smaller ones such as a Tri 210L replacing a standard 4x10 or replacing multiple cabinets with just one of ours like the El Whappo replacing two 4x10 cabinets. Next, the highs are completely natural without being harsh, brittle, or artificial. Lastly, they are reliable because they are designed for the touring pro. Are there common features found on most AccuGroove cabinets? Yes. Each driver has its own separate cabinet and uniquely tuned port to keep it isolated from the other drivers. 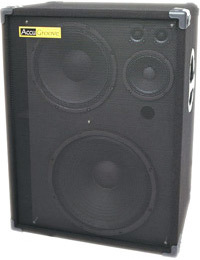 Each cabinet has a 6" midrange speaker except for the Bill Dickens 212 which has an 8" midrange. They all have two soft dome textile, ferrofluid-cooled neo tweeters instead of compression horns. They are all built using European lit-ply which is an expensive imported wood that is used to build planes and boats. They use two separate self-resetting circuit breakers. One protects the tweeters and the other one protects the 6" midrange. If these drivers start to get too much power that could damage them, they shut down independent of one another and then turn back on in 10 to 20 seconds as opposed to blowing a fuse or light bulb like in other brands. What types of speaker components are used in AccuGroove cabinets, and why have you chosen to employ that technology? We use a combination of drivers custom-built in Italy, Spain, Denmark, and the United States. It costs us more to use multiple manufacturers because we are not leveraging our buying power to take advantage of discounted pricing, but some manufacturers just do a certain thing better than anyone else. We do not use any drivers from Asia because reliability is more important to us than profit margins. Our cabs use neodymium and ceramic magnets with cast aluminum and stamped steel frames. We refuse to compromise the sound of our cabs. When possible, we try to lighten the load with the neodymium drivers. If, however, the neodymium's do not sound as good or prove to not be as reliable as the ceramic magnets, there's no motivation to use them. We are not a market-driven company where we have the pressure from the sale department trying to get us to introduce something before its ready. Neodymium may have had a bad reputation initially due to companies trying to introduce the latest and greatest technology in order to keep up with brand X. Was there a specific concept behind the Whappo Grande with the 21" subwoofer? We started receiving e-mails and phone calls from players located around the world asking us if we would address the problem they had of not being able to reproduce their low F#-string. They were struggling because manufacturers ignored their needs and treated them like the stepchild at a family reunion. With no preconceived notions, we simply brainstormed about what might possibly solve this dilemma. The concept of a 21" subwoofer seemed crazy, but we had a prototype driver made, built the cabinet, and was amazed at the colossal low end. However, the cabinet was simply too large. It was the size of an 8x10. We redesigned the driver and cabinet so it was a practical size and weight for a working player. The rest is history. The fun thing is to watch the look on a player's face when they plug in because they are expecting this slow, woofy, muffled tone from an impractical cab. Instead, they are treated to a very fast subwoofer that not only goes ridiculously low but keeps up with your playing and is very tight-sounding. Although you can bi-amp it or use an additional crossover, it's not required. How did your partnership with Bill Dickens come about to design his signature model 212 cabinet and Sub, and how do those cabinets compare to the other AccuGroove models? We met Bill at our first NAMM show in 2002, and he was blown away by our cabinets. He called us up afterwards and asked if we could build him a signature cabinet. When he described what he wanted, I told him that we could do it without a problem. He was skeptical and went on to tell me how three major amplification companies approached him to build a signature cab, and when he told them what he was looking for, they all said it was impossible. That is why he initially doubted we could deliver what he wanted. Bill loves 12" speakers so he wanted something that was more powerful than an El Whappo but smaller with 12" drivers. We engineered the Bill Dickens 212 to be a full-range, 3-way 2x12 cabinet. Its low end is designed to do justice to Bill's low B-string while it has a little more sonic clarity than our other cabs. 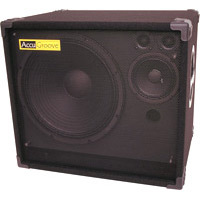 It's the only AccuGroove cabinet with a powerful 8" midrange. 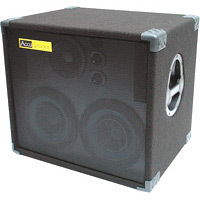 The Bill Dickens Sub is also a 2x12 cab, but it's a sub that offers immense support for the B-string and the low F#. It also retains enough low mids that it really adds to the mix. Both are 1,000 watt cabinets at 4 ohms. After nine months of hard research and design, we had his two prototypes finished. Bill flew out to our shop and was completely amazed when he plugged in because the cabinets met all of his demands. I remember Bill asking how much they would sell for, and I laughed saying that I didn't know. As we do with all of our cabs, we had to reverse engineer Bill's cabinets to find out what they cost to build and what they could be sold for. When we start a project, there are no budget limitations. The only goal is sonic purity and total reliability. We don't even calculate the cost of any cabinet until the project has been completed and our objectives have been reached. Is there much of a tonal difference between the sound produced by front-ported and rear-ported cabinets? Absolutely. Some people claim that it makes no difference at all. That might be the case with subwoofers for home stereos, but in live sound reinforcement, it's a different ballgame. This is especially true when you are playing outdoors and have no back wall to reflect sound off of. You can certainly make a smaller cabinet if you put the port in the back, but it's not the best soundwise so the bottom line is that you can most definitely hear the difference. That is why all AccuGroove cabinets are front-ported. In terms of sales, which cabinet has proven to be AccuGroove's most popular? The El Whappo is still our best-seller. I believe that's because it's the epitome of an all-in-one cabinet that is like a swiss army knife. You never wish you had a different cabinet or an additional cabinet on the gig. It's always right for every venue and every style of music because it's the chameleon of tone, and most players replace larger or multiple cabs with it. How should a bassist go about choosing between the different AccuGroove cabinets? First, I always ask players what they are currently using for cabinets and power, how many people are in their band, what type of music and venues they are playing, and how loud they need to be. You also need to figure out if the cabinet will be more of a monitor while going through the DI and the house or if it will be the main sound source for the bass. Would you prefer one 4x10 size, 78 lb. cabinet or the flexibility of two smaller 38 lb. or 42 lb. cabinets? Lastly, what kind power do you have available, and what impedance loads can be driven? These are all important variables. If you just want one cabinet and have an amp rated at 500 watts or more @ 4 ohms, then an El Whappo, Whappo Jr., or Bill Dickens 212 might be the ticket. For the same scenario, you might prefer checking out two smaller cabinets such as either two Tri 112L or two Tri 115L cabs. 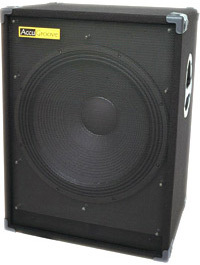 Many players get the two smaller cabs so they can take one to small gigs and both to larger gigs. If you have a stereo power amp like a Crown or a Stewart, the options open up due to more power and impedance flexibility. You can then run practically any cabinet combination you want. 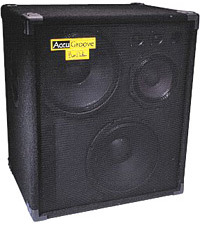 Can bassists purchase AccuGroove cabinets directly from you or do they need to seek out a dealer? We are always available and love talking to players about their needs via phone or e-mail. However, we do not sell direct and have a wonderful list of authorized dealers that are available from our website. Do you have any plans to add amplifiers or possibly combo amps at some point in the future to compliment AccuGroove's existing product line of cabinets? Eventually but don't hold your breath. It will take some time because we simply refuse to compromise the sound and reliability of our products in order to deliver something to the market faster. What's lighter than most 4x10 cabinets on the market but can easily replace two of them? It's the El Whappo, the first cabinet on the market that allows you to hear the true sound of your instrument. It's like a giant studio monitor that will produce the entire sonic spectrum of your instrument. Clarity has a new meaning, from the huge, tight bottom end through the crisp, warm mids to the sweetest highs you've ever heard. Find out for yourself what many pros are discovering, an amazingly huge and clear sound without coloration. Can you say unbelievable? This cab is so deep and clean that it hurts. It goes lower than most 4x10 cabs while having more mid presence and a more developed high end. Two of these cabinets together are ridiculous. How does Bill blow the doors off a gig? He uses 1000 watts of extreme sonic vibrations in a compact cabinet! Everything in this cabinet is different from other AccuGroove boxes including the speakers (except tweeters), protection circuit, circuit board, crossovers, and capacitors. Everything is extreme because everything is for Bill! Like the other AccuGroove 3-way cabinet designs, the Bill Dickens 212 incorporates three separate sets of drivers, each in their own individually tuned "cabinet within a cabinet."